One of the longest-serving members of the Dark Council, Darth Marr is a terrifying warrior and a true believer in the Sith Code. In the early days of the Great Galactic War, he seized world after world for the expanding Empire and gained a reputation for personally leading charges against Republic defenders. However, once the Empire had established its power and the war began to drag on, Marr found fewer opportunities to directly engage in the fray--a situation that embittered the Sith Lord. Since the demise of Darth Malgus, Marr has become the unofficial leader of the Dark Council. Disgusted by the infighting that plagues the Sith, he's gone to great lengths to promote pragmatism and even brokered a temporary alliance with the Republic to defeat Revan on Yavin 4. While some Council members may disagree with Marr's methods, none doubt that his highest priority is the Empire's best interests. Unlike previous HK units, the HK-55 model was designed to be a loyal bodyguard, not an assassination droid. Created specifically to combat the Eternal Empire during Arcann's invasion of the Core Worlds, HK-55 was given to Lana Beniko, then head of Sith Intelligence, for her own protection. Although programmed with etiquette protocols to fit Imperial culture, HK-55 still has a few personality-matrix quirks, including an obsession with the term "meatbag" passed down from the HK-47 model. Despite his amiable disposition, it would be a mistake to think HK-55 a less proficient killer than his counterparts. Koth Vortena is a former captain in the Zakuulan military who defected with his crew when he was ordered to kill civilians. While on the run from Zakuul Knights, he met Lana Beniko, and the two began plotting to dethrone Emperor Arcann. With Lana's prowess as a Sith Lord and Koth's skills in the pilot seat, the two became a formidable thorn in the Eternal Empire's side--eventually breaking out the legendary Outlander accused of assassinating Valkorion. A proud Zakuulan, Koth has high hopes for the future of his homeworld and longs for the days of peace and prosperity under Valkorion's reign. With her serene and considerate manner, Lana Beniko might be mistaken for a Jedi. However, she is a Sith Lord of great wisdom and strength who has impressed many of her peers with her keen insights into the nature of the Force. Years before the Sith Empire launched the Great Galactic War, Nico was one of the most celebrated mercenary spacers on the Outer Rim. His deeds were legendary, but so were his debts, leading him to take the most high-risk and even-higher-reward underworld contracts available. Every criminal syndicate from the Hutt Cartel down competed for his services because he always delivered the goods, no matter the odds. Ultimately, that was his undoing. When the Jedi Order assigned astromech droid T7-O1 to an undercover sting operation as Nico's co-pilot on the Redshifter, events conspired to place everyone on Korriban just in time for the Sith Empire's devastating return to Republic space. Nico personally saved Satele Shan and fled the Imperial Fleet to warn Coruscant of the danger--and promptly escaped custody never to be seen again... until now. A former Knight of Zakuul, Senya Tirall is a complex individual. Cold and unyielding on the job, kind and empathetic in private, Senya was responsible for hunting Koth Vortena and his crew after they betrayed the Eternal Empire. But Senya eventually came to recognize the same injustices in Arcann's rule that Koth had, and chose to uphold her ideals over her Emperor. After making contact with Lana Beniko, Senya joined the mission to overthrow Arcann and return peace and justice to the galaxy. Some are driven to follow in their parents' footsteps, while others loathe the very idea. For Theron Shan, it's a moot point. In keeping with Jedi strictures against attachment, Theron's mother, Grand Master Satele Shan, sent her infant son to be raised by the Jedi who trained her, Master Ngani Zho. When it became evident that Theron was not Force sensitive, he abandoned any notion of becoming a Jedi. 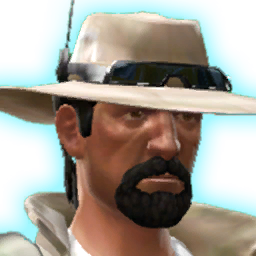 He joined the Strategic Information Service, using his adventurous nature and unique skillset to become a trusted field agent for the Republic. Despite his success against the Revanites, Theron was put on administrative leave after Master Satele and Chancellor Saresh discovered he sent a team of black-ops Jedi to Ziost without their knowledge. Arcann's invasion of the Core Worlds accelerated his reinstatement into the SIS, but Saresh's policies frustrated him. When Lana Beniko approached him with a plan to build an alliance against Arcann, Theron was happy to walk away and fight what he considered the real threat to the galaxy. Z0-0M is a cheerful droid encountered by HK-55 in the Shroud's secret base. You found Nico biding his time within the Platform 6 Cantina in the Zakuul Undercity. Nico Okarr asked you to mix him a drink of your own design as a judge of your character. The drink you made for Nico Okarr impressed him. He has agreed to join you as a follower. Your inclusion of the little umbrella in Nico's drink particularly impressed him. You failed to include the little umbrella in Nico's drink. He will never forget it.